The Hubbs and I moved to Chicago in 2007, and since then we have been unimpressed with the city’s typical snowfall. Sure, we get quite a bit over the course of a winter. 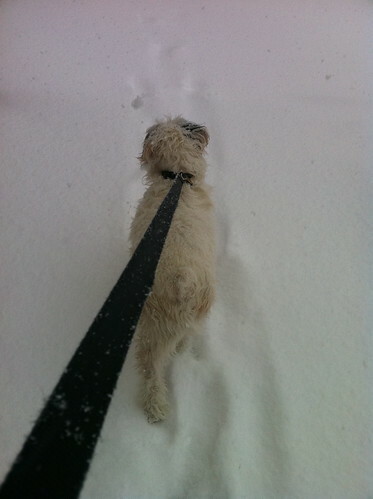 But we wanted one of those epic snowstorms where you are wading through knee-deep piles, throwing snowballs and laughing at the dog as she hops around up to her face in white powder.We finally got what we were waiting for. It started with some little chunks falling mid-day Tuesday, followed by 60 mph winds. 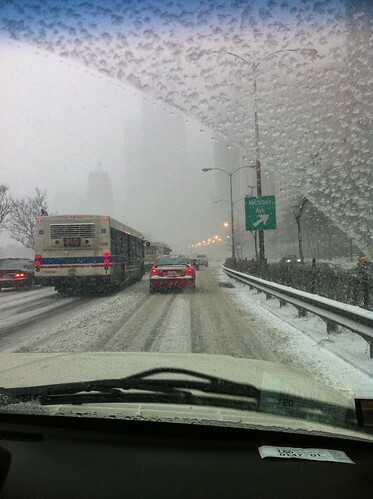 I got a ride down Lake Shore Drive a few hours before it became a total disaster. At the time it was slushy, but not apocalyptic. So what else is there to do, when the snow is gusting down your street and the thunder is booming and the lightning is providing a little mood and ambiance, except go to the neighborhood watering hole? 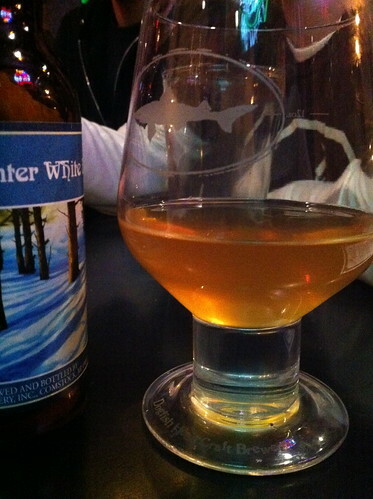 A white winter night deserves a winter white ale (from Bell’s). By Wednesday morning, the snow drifts were out of control, the streets were un-plowed, and the commute seemed unbearable. I opted to work from home. But first I had to go exploring with my trusty companion. We didn’t last long. So I hunkered down at my kitchen table with my laptop, a bowl of oatmeal and a stack of editing. I took a few breaks to grab coffee, take photos of my neighborhood and update my mom about the weather. Those are all necessary things for persevering through a snow day. The day was complete with a little flatbread pizza, some time with friends and a couple beers. On Thursday, I’ll face a long commute, a negative wind chill and a city full of stories about the legendary blizzard of 2011. 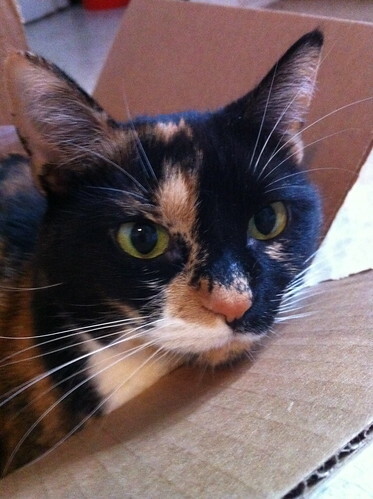 In the meantime, I’ll enjoy the time at home with Kitty. Stay safe! Stay warm! Enjoy the weather, wherever you are.